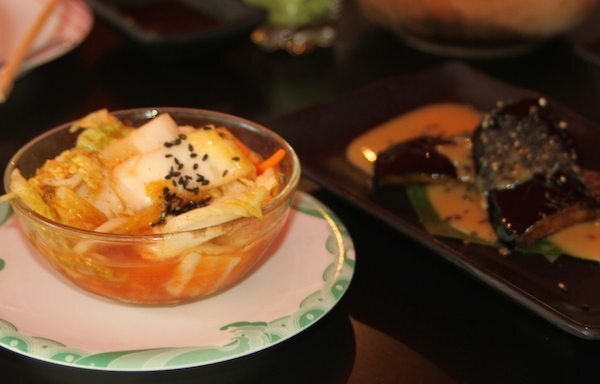 Moshimo Brighton – Little Plates, Lots of Joy! 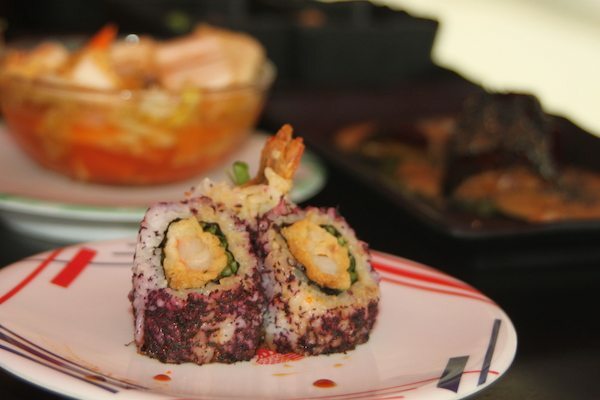 Widely considered Brighton’s best loved place to grab some sushi, Moshimo Brighton is one of my favourite places to eat. Located in Bartholomew Square, in the heart of Brighton’s Lanes, it is a prime location for a spot of lunch or after work dinner with friends. The restaurant stands alone, a modern, predominately glass structure, tucked back from the main stretch of shops and restaurants. In the summer the glass walls can be rolled back opening up the dining space to the outside. This evening, with the afternoon sun beaming inside, it feels like alfresco dining. The restaurant is clean and bright and the food moseying round about us is lit up by the sun light, making it appear even more tempting that normal. The walls are reminiscent of traditional Japanese screens and are decorated with pictures of naked celebrities embracing very large fish. This art work might seem strange out of context, but it is there to remind us that Moshimo take sustainable fishing very seriously. They are the folks behind the ‘Fishlove’ campaign for which these photos were taken. Sustainable fishing is not all that Moshimo Brighton value. They attribute many things to the quality of the food they create. 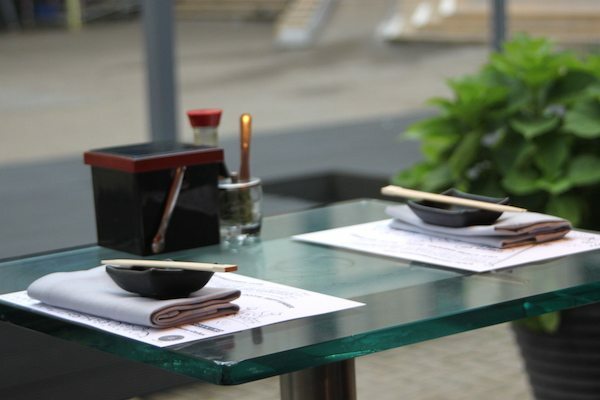 Following the fundamental principles of traditional Japanese cooking, Moshimo use only the freshest produce, seasonal ingredients, and never over cook anything! They say this ensures simple, yet bold dishes, with a style of preparation which respects what we eat and keeps it close to its natural essence. They boast homemade stocks for their soups and several homemade sauces, including their teriyaki which takes 5 hours to create. They also source many of their vegetables from Ikuko and Robin, who have a small farm in Lewes growing Japanese vegetables and herbs. It’s this attention to detail that makes Moshimo such a great place to be. As well as this, I have always thought dining at Moshimo Brighton to be good fun. If you want to order from the a la carte and have more of a traditional dining experience, you can. You can sit at a table and order everything with one of their very attentive waiters. 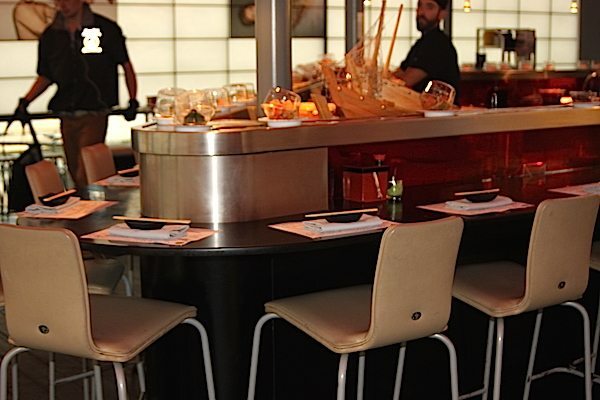 However, if you want to tease your taste buds before you eat, I rather like the ‘conveyor belt dining’ at Moshimo. There is something quite exciting about seeing all their beautifully prepared dishes passing you by, before you commit and grab one. It also makes you more daring, as often you have no idea what it is you have selected and trying new things is no bad thing in my book! As my friend is a vegetarian, and cannot be as carefree with her selections, she decides to order from the menu. I start eying up the conveyor belt. We order two large glasses of house red, not very traditional, but just what the doctor ordered. Should we have wanted to go ‘Japanese’, we would have been spoilt for choice. The drinks menu spans sake, plum wine, Japanese beer, spirits, a modest selection of loose leaf tea, plus all the usuals. I get stuck in pretty quickly. I prepare the soya and wasabi dipping sauce for us both, eat a bit of pickle ginger – because I can’t get enough of it – and turn my attention to the food. The Spicy Tuna Maki has been staring at me for some time. It looks wonderful, perfectly formed and coated with a spicy orange sauce. 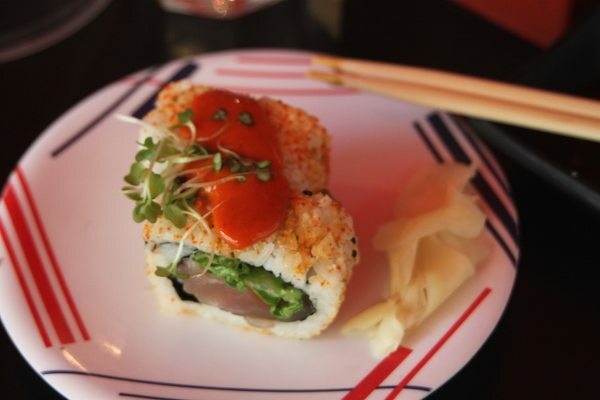 The taste doesn’t disappoint; the tuna just melts in the mouth and the chili sauce adds a kick. My friend’s first order of Crispy Vegetable Gyoza, Miso Soup and Agedashi Tofu follows suit. Fish is literally my favourite thing, but even I have to admit this vegetarian selection looks great. Gyoza dumplings are loved by all – little parcels of finely chopped vegetables and lightly fried – they are simply moreish and seriously satisfying. The Tofu, something I might normally deem bland and uninteresting, proves me wrong. Crispy fried in cornflour and served in a dashi sauce, the flavours and different textures of this dish make it a real pleasure to eat. The miso is a really nice surprise as well. Made with organic shiitake mushrooms from the Espresso Mushroom Company, with a hint of chilli, this unassuming broth is a seriously tasty bowl. Next up – my go to dish – Salmon Sashimi. The sashimi dishes are the more expensive dishes on the menu, but in my opinion, some of the best. 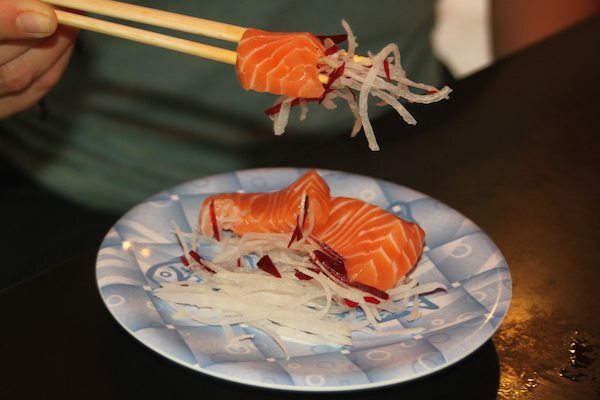 True simplicity – freshly cut raw fish – and so enjoyable to eat. 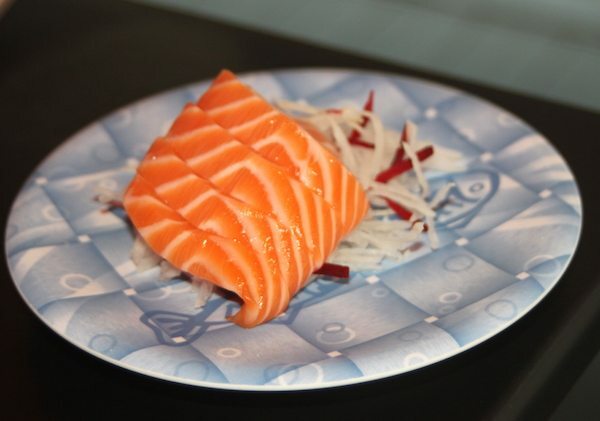 I have tried all the sashimi, but favour the creamy and mild flavour of the salmon, and it looks so gorgeous too! I grab a Kimchi Salad as well, another favourite of mine. A Korean dish of pickled cabbage and carrots, which is good for the digestion, low in calories and full of vitamin C. It tastes great – an interesting mix of sour, spice and crunch. 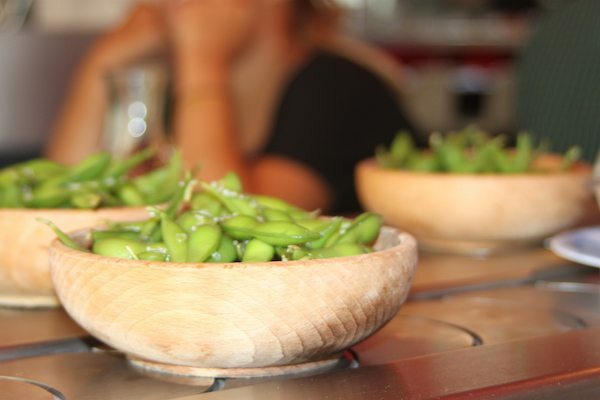 Of course we share a bowl of salty Edamame. We both enjoy the process – popping the peas into our mouths straight from the pod. My friend also tucks into a wonderful shiny plate of Aubergine dengaku. Pan fried perfectly and smothered in a miso sauce, this dish is a winner in her book, and I have to agree. 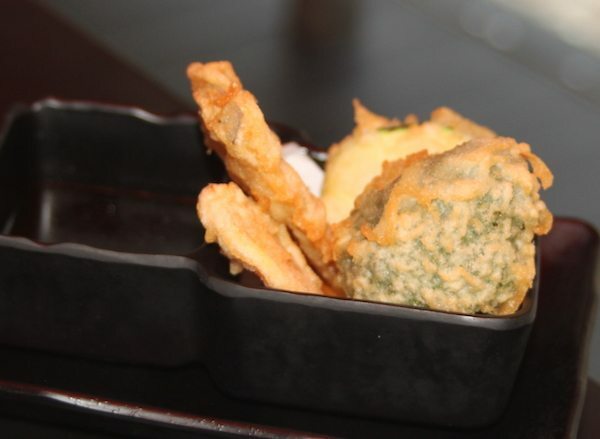 Some Vegetable Tempura follows this; a selection of veg in a light, crispy batter – this is serious savoury greatness! With a taste for that scrummy tempura batter, I decide I can squeeze in one more plate and grab the Prawn Tempura Maki. It is vibrant and eye catching and stands out amongst the other dishes circulating the room. The battered prawn tail pops out from a blanket of purple rice; I ask the waitress what the pretty purple coating is, wondering if this is giving the sushi its distinctive sweet flavour. She goes away to ask the chef and comes back with a bit of paper with ‘Perilla leaves’ written on it. I later look this up to find out it is a green herb of the mint family. The purple rice remains a mystery. Now we are starting to feel surprisingly full. It is easy to get carried away when all the dishes are at arm’s length, but we don’t feel like being gluttonous. We agree that although the desserts look wonderful – we have watched the Chocolate Trifle, Chocolate Mousse, Mochi Rice Cakes and the Dorayaki Pancakes saunter past us more than once this evening – we will listen to our stomachs and call it a night. Besides if we were going have a dessert, it would surely be the Moshimo recommended – Tempura Ice Cream. Ice cream, rolled in layers of Madeira cake, and coated in tempura batter – can it be it any more indulgent? There is something very attractive to me about this kind of dining – finger food, eating with my hands, drinking from the bowl – it adds to the stripped back and honest nature of the cuisine. My friend is sold; she hasn’t taken her eyes off the menu, pointing out the wide range of vegetarian and vegan dishes. We comment on the relaxed atmosphere and the beautiful food; we sip the last of our wine and agree Moshimo is a great place for a meal out. I know it won’t be long before we return to Moshimo; all night we’ve been making mental notes of the dishes we will order. 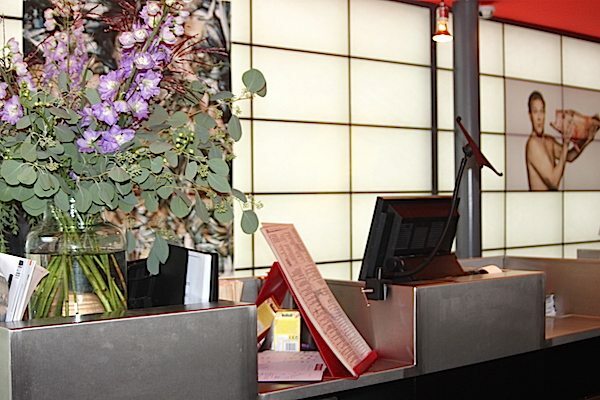 And now with Moshimo Monday’s and Tuesday’s – 50% off for Moshimo members – and Moshimo Sunday’s – where all dishes from the conveyor belt are £2.60 – there’s even more reason to get into sushi! !